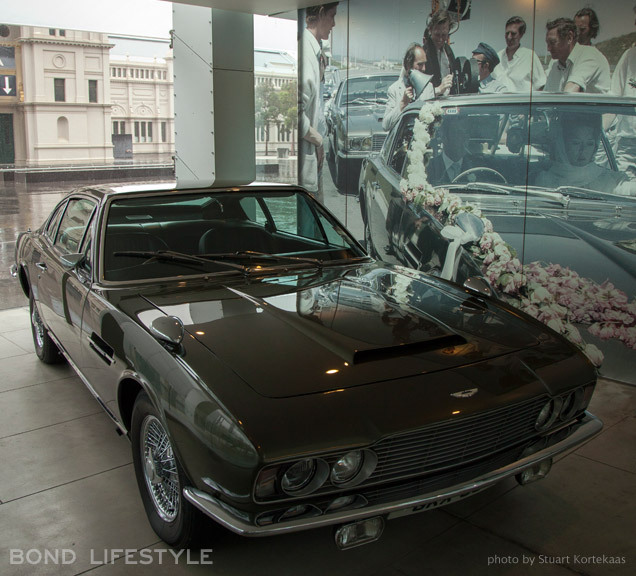 Bond fan and photographer Stuart Kortekaas reports from Melbourne, Australia, where currently the Designing 007 exhibition is on display. 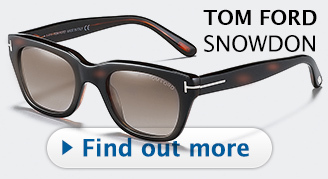 For over 50 years James Bond movies have been synonymous with glamorous style, exotic locations, luxurious sports cars, and the very latest in technology. As the name suggests, the exhibition Designing 007: Fifty Years of Bond Style gives a rare look into the craft involved in creating these films, with rare samples of design work on display from EON’s production archive. Even before stepping inside the museum it’s clear that the scale of the exhibition is suitably larger than life, and appropriate to the world’s most iconic movie brand, with the entire front of the museum decorated with billboard sized publicity photos of all six actors who have played 007. 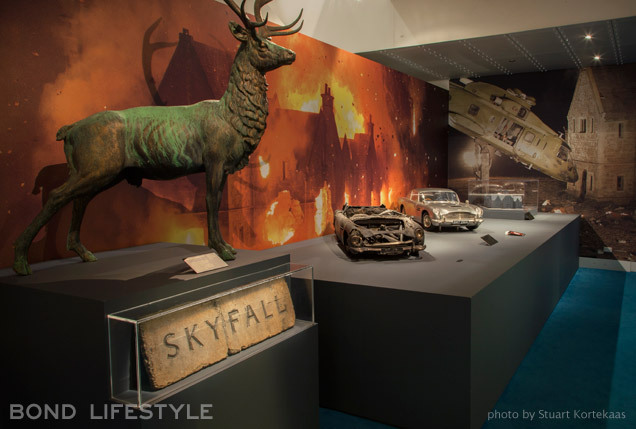 Organised by the Barbican Centre in London, in partnership with EON Productions, the exhibition features over 400 objects, including such iconic movie props as the attaché case used by Bond in From Russia With Love (1963), and the Aston Martin DB5 featured in both GoldenEye (1995) and SkyFall (2012). 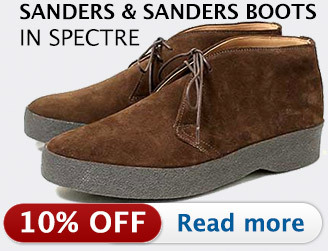 Like Bond himself, Designing 007 is truly international in scope. First shown in London, then travelling to Toronto and Shanghai, the exhibition is currently in Melbourne for its only stop in Australia, before travelling to Russia and then the Netherlands later in 2014. 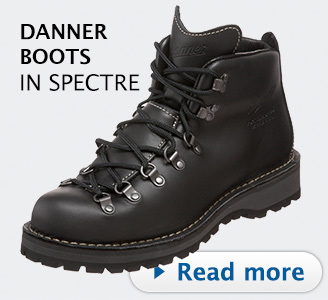 The Melbourne run of Designing 007 features several world firsts. 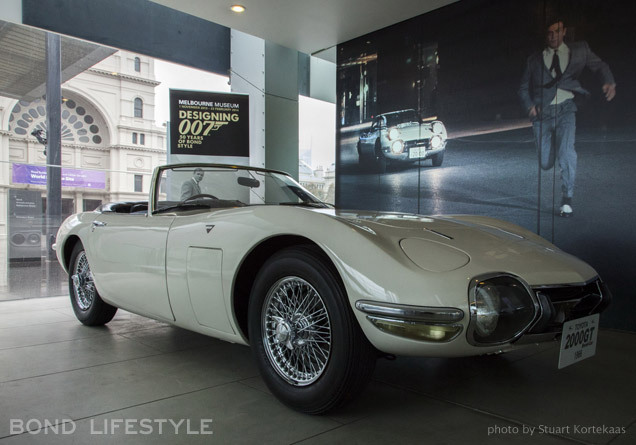 Most notably it is the only time that the ultra rare Toyota 2000GT convertible from You Only Live Twice will be on display during the exhibition. It is one of only two ever made by Toyota, especially for the film in 1966, as it was discovered that Sean Connery was too tall to fit into the existing 2000GT coupe! Insured for literally millions of dollars, this car rarely leaves the Toyota Museum in Tokyo, and only then for less than 3 months at a time. For this reason during the first stage of the exhibition another rare James Bond car was featured, the 1969 Aston Martin DBS that was driven on Guincho beach in Portugal by Diana Rigg at the start of On Her Majesty’s Secret Service. Like the Toyota, this Aston Martin is only taking part in the exhibition while it is in Melbourne. 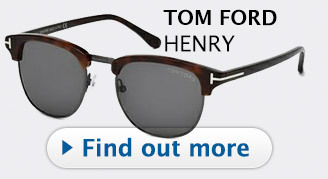 As a qualified industrial designer, I have to say the exhibition certainly lives up to the title Designing 007. Freehand sketches, marker concept renderings, foam mock-ups, presentation scale models... there are objects on display from every stage of the design process. 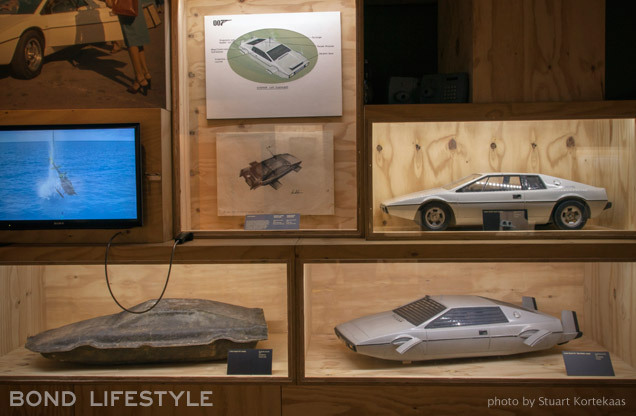 Being able to view scale models (both on-road & underwater specifications) of the Lotus Esprit from The Spy Who Loved Me (1977) I think is worth the price of admission alone! Having followed the movies since a child, including seeing essentially every ‘Making Of’ documentaries about the films, I wondered before entering the exhibition just how many items it would contain that I wouldn’t have seen before. 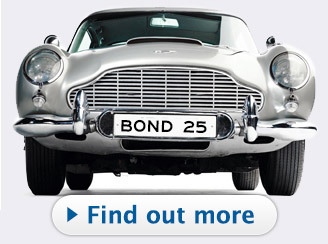 Well avid Bond fans, have no fear, as the curators had over 50 years of movie production to select from, I think it’s safe to say there’ll be items to interest even the most dedicated of 007 fans! For example drawings of gadgets that were considered but never used on film, such as the concept for a briefcase containing an inflatable life raft for Moonraker (1979)! 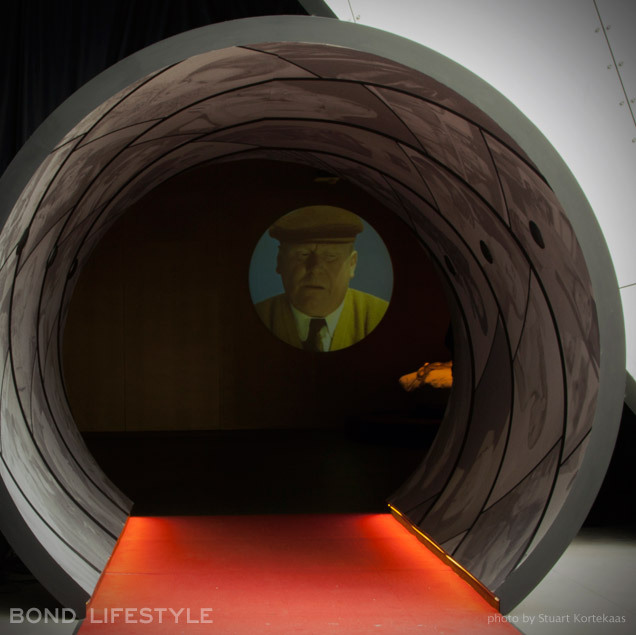 You enter the exhibition by walking through a tunnel inspired by the iconic 007 gun barrel motif, complete with a dot on the wall in the distance playing video clips. 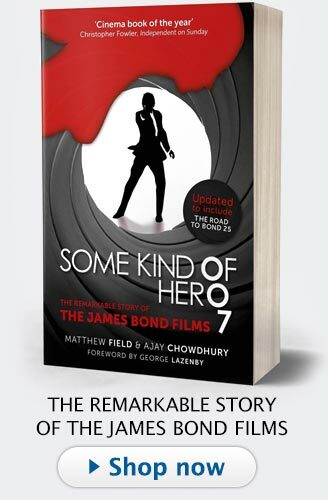 From there you travel through a series of themed rooms, each dedicated to illustrating a various aspect of the Bond world. By far the largest of the rooms is the casino room, which features mannequins dressed in some of the most stylish men’s and ladies clothing to ever be featured on film, including 007’s iconic suit from Dr. No (1962) by Anthony Sinclair, and the stunning dress Naomie Harris wore as Moneypenny during the casino scenes of SkyFall (2012). 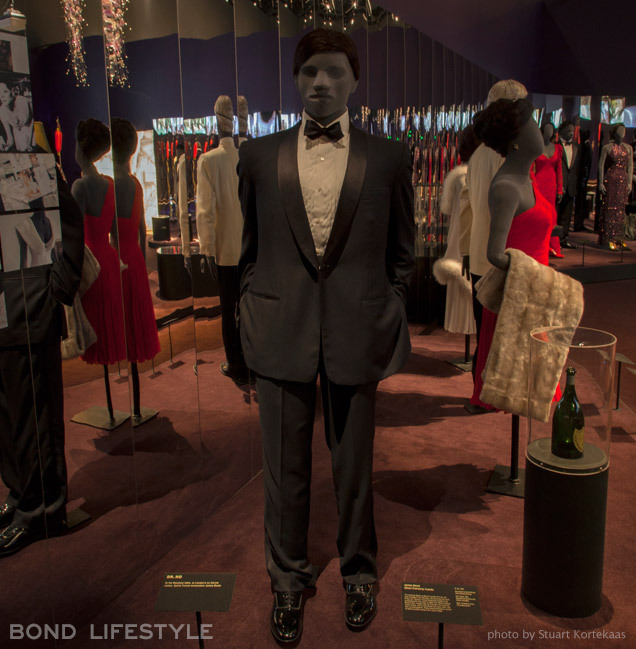 Fashion plays a major role in Designing 007, which comes as no surprise considering the exhibition was guest curated by fashion historian Bronwyn Cosgrave, and Oscar® winning costume designer Lindy Hemming. With all the action and exotic locations it’s easy to overlook and take for granted that the movie characters, particularly the leading ladies, are always glamorously dressed. 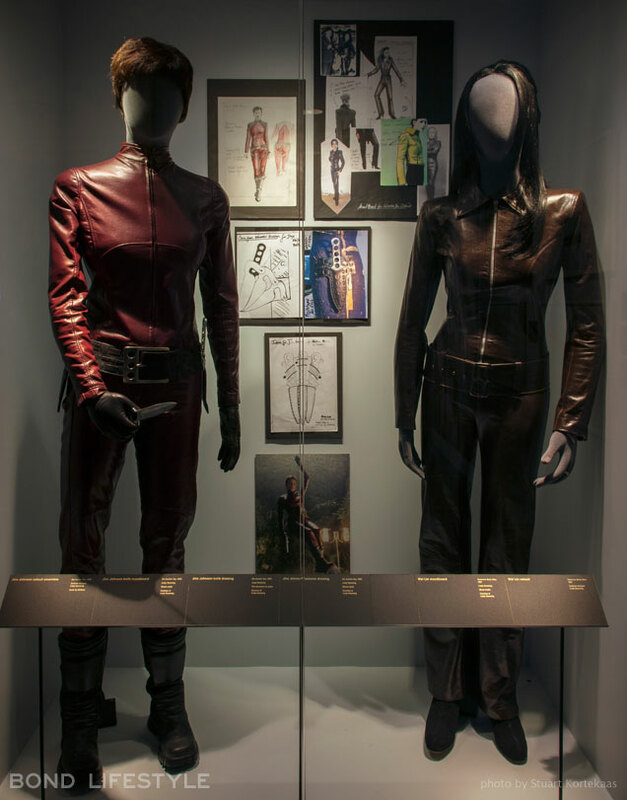 Interestingly next to some of the clothing on display, such as the cat suit worn by Michelle Yeoh in Tomorrow Never Dies (1997), is the original mood board containing various clippings that inspired the design, from both real world and fictional sources (which in the case of the cat suit including publicity shots of both Diana Rigg and Honor Blackman from their time in the 1960’s television series The Avengers!). 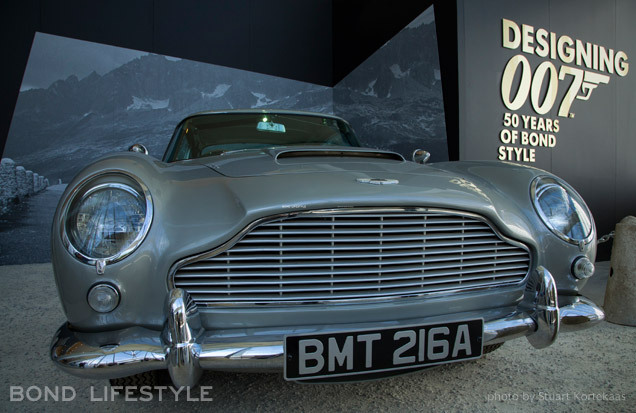 Other special additions to the exhibition in Melbourne are the models of the Aston Martin DB5 and SkyFall statue and sign. I highly recommend this exhibition, particularly to anyone interested in fashion & design! 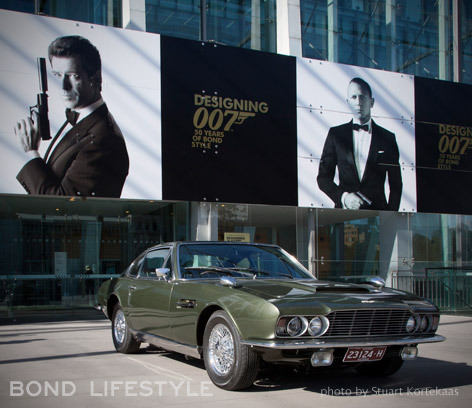 Designing 007 is on display at Melbourne Museum until 23 February 2014. 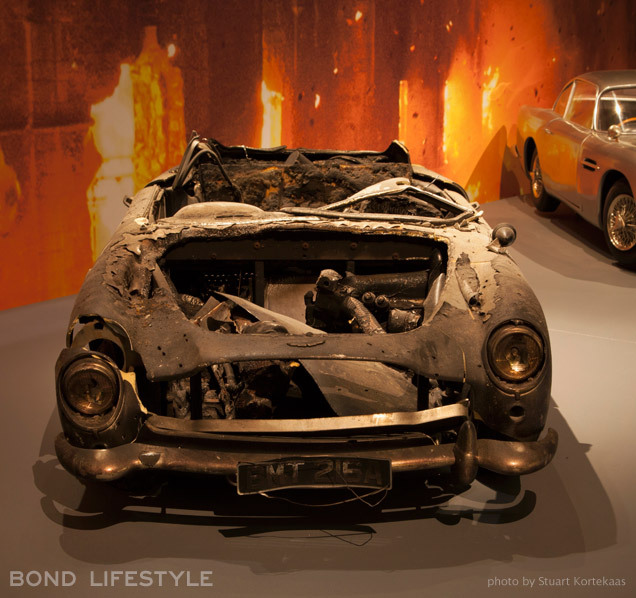 Which City is the James Bond Exhibition in Melbourne moving to next? The exhibition will go to Moscow (Multimedia Art Museum) in Russia, and after that to Rotterdam, The Netherlands. 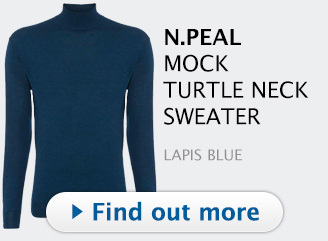 Does anyone know if or when this exhibition will be coming to England ? Recently went to this exhibition in Melbourne and I have to say, if you get the chance to go please do it. 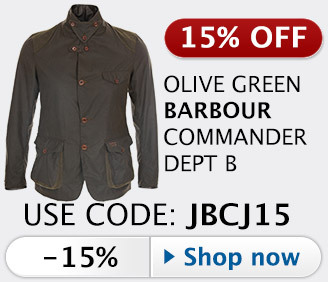 Being a James Bond fan my entire life, I felt like a kid in a candy store. In January, I visited this museum.That's pretty impressive and it was amazing.